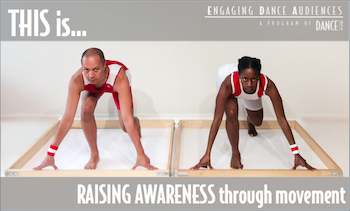 In 2016, Dance/USA presented its third series of biweekly webinars on audience engagement, made possible by the Doris Duke Charitable Foundation. 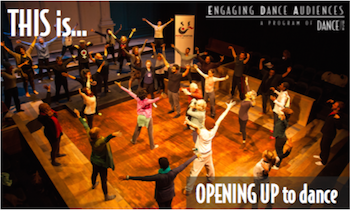 Engaging Dance Audiences (EDA) Round Three grantees shared the engagement methods they explored in their projects. These interactive webinars began with grantees live on camera and segued to live "call-in" discussions and questions. During each webinar, a shared whiteboard captured a summary of speaker comments, shared resources, and answers to questions posed. The goal was for everyone to leave with fresh ideas, new resources, and guidance. Webinars are appropriate for artists and administrators in the areas of marketing, education, and fundraising, as well as teachers and even those working in other art forms who want fresh ideas for engaging audiences. Shared Whiteboard and Resource List here. Some artists choose to choreograph in sites that raise awareness of social issues. Hear from artists who are inspired to create and perform outside of standard venues, and engage audiences in the issues raised by their work. Artists include: Heidi Duckler Dance Theatre, whose workGet Your Feet Wet, about the environment, was performed in settings around Los Angeles; and Holly Bass|360, whose work Race: Talc and Ash uses visual metaphors to explore inequality and occurred at the Martin Luther King Jr. Memorial Library in Washington, DC. Photo: Holly Bass and Christopher K. Morgan in Holly Bass | 360's Race: Talc & Ash, exploring gentrification, race, and class. 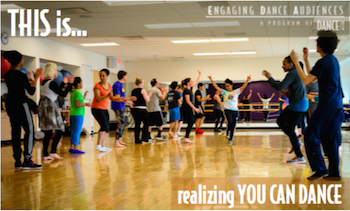 Meaningful engagement can move occasional attenders to become dedicated “community” members who believe in the power of dance. Hear from grantees who have successfully fostered a sense of community and connection among their dance audiences. Speakers and programs include: Urban Bush Women, through their Summer Leadership Institute; Heritage Works, through their Cultural Scripts program; and American Tap Dance Foundation, through their Tap Treasures program. 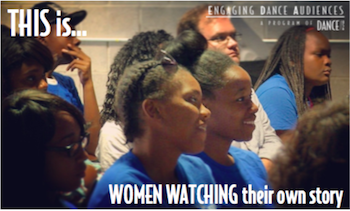 Photo: Two young women who, after participating in Heritage Works’ Cultural Scripts community dialogue, watch a performance inspired by their conversation. Can we engage audiences in dance by tapping into their own passions? 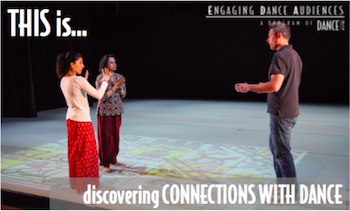 Yes, say some EDA grantees who are finding connections between their dances and audiences’ personal beliefs and interests. Speakers include: Chitresh Das Dance Company who, through Decoding Dance, engaged South Asian tech professionals around kathak’s complex mathematical rhythmic systems; Ragamala Dance who, through their work Written in Water, engaged the Indian community through the ancient game of Paramapadam and other interests; and CONTRA-TIEMPO who involved audience members in defining and shaping their new work Agua Furiosa, about water as a natural resource and its relationship to race. Photo: Audiences connect playing the ancient board game Paramapadam with the floor-sized version, used as a set for Ragamala’s Written in Water. Dance reflects history, culture, and the world around us. 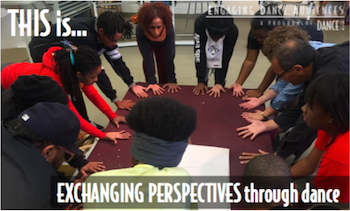 For some EDA grantees, engaging dance audiences involves contextualizing the art form and sparking discussion around broader issues, both contemporary and historical. Hear from: Kings Majestic Corporation (651 ARTS) about Classically Black, exploring the history and artistic forms rooted in African Diasporic aesthetics; Angela’s Pulse about Dancing While Black: On Fertile Ground, exchanges between Black experimental dance artists and communities; and the Walker Art Center, whose contextual resources and other engagement strategies merge humanities with movement and visual art practices. Today, the dance field strives to be inclusive of all audiences, who vary in their physical and cognitive abilities. Hear from EDA grantees about how they plan and prepare accessible programs designed to reach audiences with disabilities. Grantees and their programs are: Cincinnati Ballet Company’s Gentle Nutcracker, attended by children with disabilities such as autism and Down syndrome and their families; Millersville University’s residency with Axis Dance Company, designed for audiences of mixed physical abilities and wounded warriors; and Keshet Dance Company’s repertory integrating dancers with disabilities throughout New Mexico. 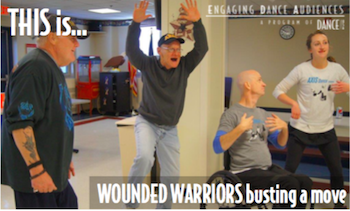 Photo: Veteran Popeye leading the pack at Millersville University’s movement workshop tailored for wounded warriors by AXIS Dance Company. Organizations that host numerous artists over a season have opportunities to engage repeat audiences. But how do they motivate those audiences to keep coming back? Hear from The Dance Center at Columbia College Chicago, which has expanded its community engagement residencies; Jacob's Pillow Dance Festival, which employs a range of engagement activities over the course of the summer; and University Musical Society, which runs ongoing engagement programs and has expanded its reach to the Detroit area. Photo: Throughout their season, University Musical Society offers its You Can Dance community master classes, open to people of all levels of dance experience. Is all dance local? How can dance organizations, even when presenting touring artists, engage people within their neighborhoods? Hear from Firstworks, whose residency with Urban Bush Women involved activities in a range of locations in Providence; Chicago Human Rhythm Project, whose citywide celebration of percussive dance happened alongside events in Chicago neighborhoods; and Dance Theatre Etcetera, which engages audiences in the predominately African-American and Latino neighborhood of Red Hook, Brooklyn. Photo: During their Firstworks residency, Urban Bush Women inspires community members to dance together. Some artists are dedicated to expanding young people’s views not only about dance, but about themselves, so that they develop artistically, speak their minds, and realize their potential. Hear from BANDALOOP about their 16-year long engagement program for youth through Destiny Arts Center in Oakland; Camille A. Brown & Dancers’ Black Girl Spectrum, a residency program that explores the effects of historical beauty standards and values on African American women and girls; and Everett Dance Theatre’s Freedom Project, which pairs artist mentors with youth to create work and train youth in audience engagement. 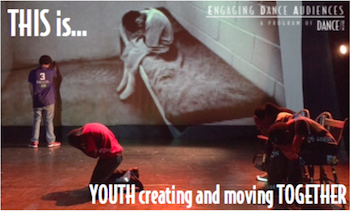 Photo: Youth and artist mentors in Everett Dance Theatre’s Freedom Project perform their work about mass incarceration.